With a roomy 3rd row and versatile AWD this Nissan Pathfinder is perfect for the family! Our One Owner, Accident Free 2015 Nissan Pathfinder SV 4x4 in Brilliant Silver is everything you could want in a 7-passenger SUV! The magic begins with our award-winning 3.5 Liter V6 that offers 260hp while mated to Nissan's next-generation Xtronic CVT. Together, they help the Pathfinder achieve up to 26mpg and also allow up to 5,000 pounds in towing capacity in this sure-footed Four Wheel Drive! The great-looking alloy wheels, rear privacy glass, fog lamps, chrome accents, rear lip spoiler, and roof rails enhance the sporty vibe of our Pathfinder SV! Enjoy the versatility of our cabin that features keyless entry, an advanced drive-assist display, tri-zone automatic temperature control, push-button ignition, a leather-wrapped steering wheel with mounted controls, power driver seat, and the EZ Flex seating system. With all three rows occupied, you can still manage to fit up to 16 cubic feet of cargo thanks to clever ideas like our under-floor storage! Settle in, enjoy the ride, and stay connected via the Bluetooth hands-free phone system or better yet, crank up your favorite tunes on the fantastic AM/FM/CD audio system with auxiliary input. 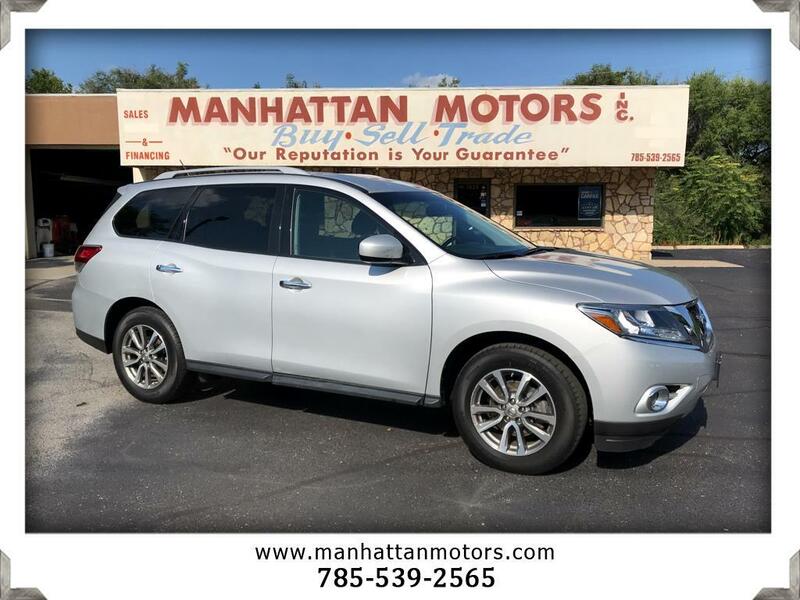 A 2015 Top Safety Pick, our Pathfinder has been carefully designed with a rear view camera, vehicle dynamic control, a traction control system, six airbags and more! Treat yourself to an SUV that has all the features you demand and the style you desire! Print this page and call us Now... We Know You Will Enjoy Your Test Drive Towards Ownership! Thanks for choosing Manhattan Motors. We recently won The Manhattan Mercury Readers' Choice Award for being the #1 Used Car Dealer. Buyers enjoy our "laid back" approach. No test drive routes or high-pressure salesmen. Our focus is to offer all of the information you need to help make the best decision for your family or business. Each one of our vehicles undergoes a 30-point vehicle inspection by Burnett Automotive, Manhattan's #1 Auto Service Facility. We are also the area's only Independent USAA Certified Dealer, offering discounts on purchases and interest rates.